Are you looking for a coffee table for your living room or family room? We have over 200 beautiful Amish-style coffee tables and accent tables in our collection! 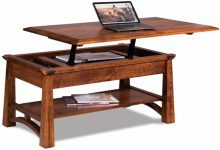 When you add in the varieties of wood and stain to choose from, there are countless ways to create your own personal Shaker or Mission-style coffee table. 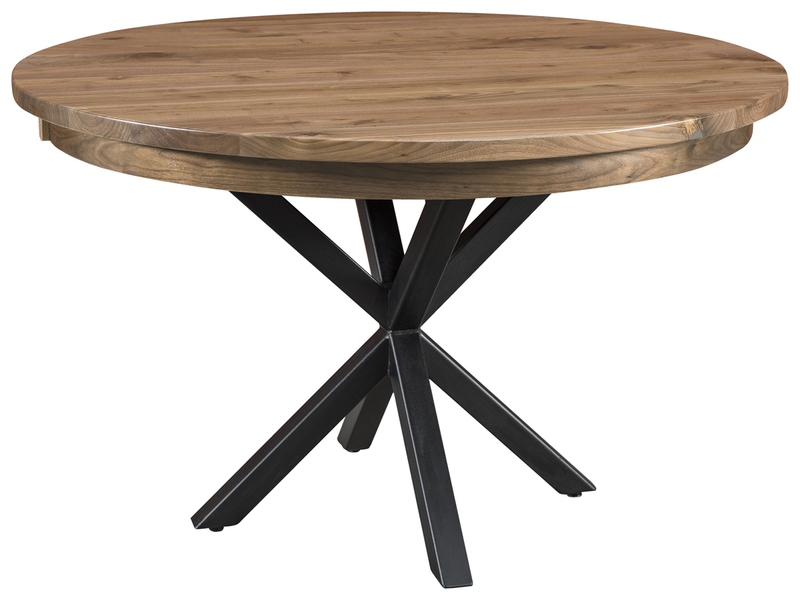 Constructed using age-old techniques by hardworking Amish artisans using only the best northern, kiln-dried hardwood, our tables are built to last. We provide a range of options, from simple, classic styles to more elaborate versions with moveable tops and integrated storage. We also have models with adjustable tops for use with a computer or for homework. There’s no end to the number of different sizes, heights and shapes of solid wood coffee and occasional tables available. It’s easy to integrate our Amish living room tables into any décor. You can choose tables that match your current style, or opt for a contrasting design and color to highlight the beauty and uniqueness of the piece. It’s easy to find all sorts of modern coffee tables and accent table styles. Big box stores carry all different types. But the problem with a lot of modern furniture is just that: It’s modern. It looks good today, but will quickly become dated. And since these mass-production items are meant to be tossed and replaced after a few years, the manufacturers don’t make them to last. Particle board and composites full of chemicals are used to keep their cost low and their weight light, and they’re often assembled using low-quality plastic hardware. Another concern is that these coffee tables are often produced in low-cost countries, with little to no concern given to the health, safety and well-being of the workers. Wouldn’t you rather see your money going to support hardworking Amish families right here in America? Families that have learned their craft from their parents and grandparents, and will pass along that priceless knowledge and know-how to their children and grandchildren? Show your pride in solid wood Amish furniture by purchasing one of our beautiful coffee and occasional tables. Deciding to purchase a quality Amish hardwood coffee table is easy, but choosing that table takes a little more thought! Thanks to our online catalog, you can do your shopping from the comfort of your own home. Enjoy browsing our pictures and descriptions to find the designs that interest you the most. We provide you with all of the information you need, like length, width and height, and details on shelves, drawers and storage. And if at any point you have any questions, feel free to contact us, by email or by telephone. One of our friendly sales staff will be more than happy to answer your questions and help you make the right choice in tables for your living or family room. Once you’ve chosen your style, the next step is choosing your wood. Choose from a great selection like oak, maple, and cherry. The choice of wood will come down to your personal preference and the unique natural grain that each wood provides. Other wood choices for certain models include hickory, white oak and brown maple. In all cases, the wood for our Amish coffee and occasional tables is kiln-dried in the northern states, so you’re assured of the quality. Amish artisans carefully inspect the wood before starting your tables, to guarantee a natural and harmonious appearance in the finished product. Your final choice is the stain you’d like applied to add beauty and protection to your coffee table. Many of our tables come in a variety of stains, so you can make your choice according to the décor in your living room or family room. Choose a finish that matches perfectly with your existing furniture, or opt for a contrasting color. 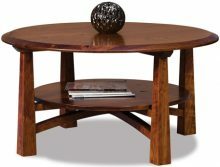 You will also find that many off our hardwood coffee and accent tables are part of larger furniture collections. This allows you to match your coffee tables to any number of living room furniture pieces (like TV and stereo cabinets, wall units, curio cabinets and other accent pieces). When you make the choice to purchase quality Amish hardwood coffee and occasional tables, you’re planning ahead. This isn’t furniture that will serve a year or two and then need to be replaced. Take the time to think about the types and sizes and styles of tables you want. Are you partial to traditional Mission and Shaker styles? Do you want something with elegant curves and details? Would you like all-wood, or a table with a glass top? Some of our coffee and end accents have drawers, shelves and other storage compartments. The choice is endless, because we want to do all we can to satisfy the needs of all of our customers. The common denominator in all of our furniture? The beauty, quality and durability of every single piece. You can trust the hard work and attention to detail that Amish artisans put into their furniture. It’s a reflection on them and their traditions, and they won’t disappoint. They’ll put the individual time and care necessary to produce a perfect table for you. They’ll choose the wood carefully, matching the natural grains for a harmonious appearance in the finished product. We have brought together one of the biggest and best collections of Amish furniture in America. We’re especially proud of our huge range of oak and hardwood coffee and occasional tables. There really is a coffee table for every living room and every family room. As you can see, the reasons to build and order your hardwood Amish coffee and occasional tables from us are obvious. Finish your living room with one of our handmade Amish coffee tables! Our Shaker and Mission coffee tables are custom-made from quality materials. We offer coffee tables in all shapes, sizes and even some with drawers! Choose an Amish coffee table and add a beautiful accent to your home.